A new plan. Physical games. A very Platdude styled set of cards are ready to be used, but there's no game for them to go into, yet. Today will be about starting a new framework to cope with them. A menu will be created, and from there the script will load various game scripts, with all manner of different gameplay experiences held within. Card games, Board games, Dice games..
All those little games that are too fidgety for regular AGameAWeek, but that also don't really work well as Pen'n'Paper Foldapuz games. I've plenty of little ideas bubbling in my head, already, but a lot of them seem to require AI and GUIs and things, and ..
Today I need to deal with the first little bit. 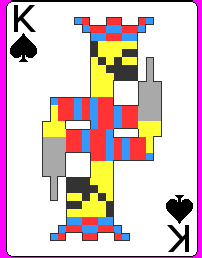 Writing a script to load the big card spritesheet, create a canvas, and see how well it'll cope drawing all the cards onscreen at once. At the very least, even basic Solitaire is going to require that much. I have absolutely no idea how well it'll manage, and this may very well be the end of the road! !